GIMCO U.S.A. works with projects in 33 developing countries. Our global presence enables us to work in close cooperation with our clients at their headquarters and throughout their regional and field offices. GIMCO U.S.A.’s cornerstone is its dedicated logistics function which handles the inventory, packing, and delivery of all products to countless locations around the world. 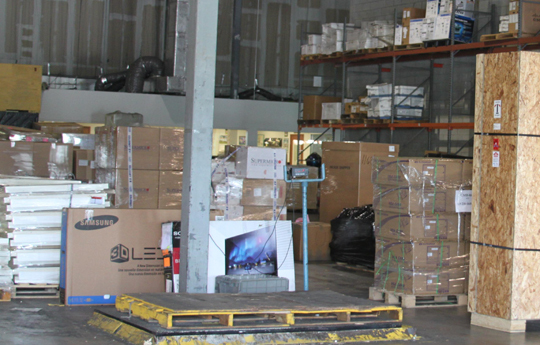 Our logistics set-up has overseen the timely delivery of thousands of products to hundreds of destinations globally. From war zones and failed states to natural disasters and long term infrastructure projects, we can work for you. GIMCO U.S.A. is a PROCUREMENT and LOGISTICS company. We specialize in assisting International Aid Organizations, UN Agencies, and NGOs involved in relief and development projects worldwide. GIMCO U.S.A. was founded over two decades ago in Connecticut and reincorporated as a Florida Corporation in 1996, becoming female owned in 2002. Our minority-owned company has offices in Lake Worth, Florida, warehouse facilities in Miami, Florida, and support staff in Washington, D.C.; Oregon; Guatemala City, Guatemala; and Port au Prince, Haiti. We provide diverse products and services to aid, relief, and development projects in the developing world. GIMCO U.S.A.’s infrastructure and financial stability assists program organizers and directors with product research, procurement, consolidation, shipping, and customs entry. GIMCO U.S.A. actually teams with clients ensuring a smooth, cooperative process. From assisting in the initial bidding process to setting up and maintaining the necessary infrastructure for a project in the third world, GIMCO U.S.A.’s experienced professionals pride themselves on understanding all components of each project. GIMCO U.S.A. prides itself in its multiple role as both a procurement agent and a researcher/advisor in streamlining each transaction. We are a creative, innovative, flexible, and dependable part of the project team. MAINTENANCE of projects in the third world is an exceptional challenging task. We are experienced in SET-UP of office, vehicle, and project maintenance plans in advance of opening a project. GIMCO U.S.A. will enable the project to accomplish its tasks without slowdowns or waits due to seemingly small inconveniences. GOOD PREPLANNING and forethought makes the difference in meeting deadlines, working efficiently in an emergency, and keeping costs to a minimum. Emergencies can take on new meaning in underdeveloped countries, and GIMCO U.S.A.’s veteran staff understand and appreciate the complexities of project emergencies in the third world. Gimco’s employees are knowledgeable and flexible, using their experience combined with GIMCO U.S.A.’s financial strength to resolve emergencies as they arise. The customer’s emergency is GIMCO U.S.A.’s emergency. Experienced and responsible, our staff tracks every shipment to ensure timely, accurate, and cost effective delivery to even the most remote project locations and under extreme conditions. GIMCO U.S.A.’s infrastructure helps to speed project set up time and follows up by designing an in place, consistent, and dependable maintenance plan freeing project specialists to concentrate on their jobs. At every stage of a project, GIMCO U.S.A. creates a seamless procurement and maintenance system.